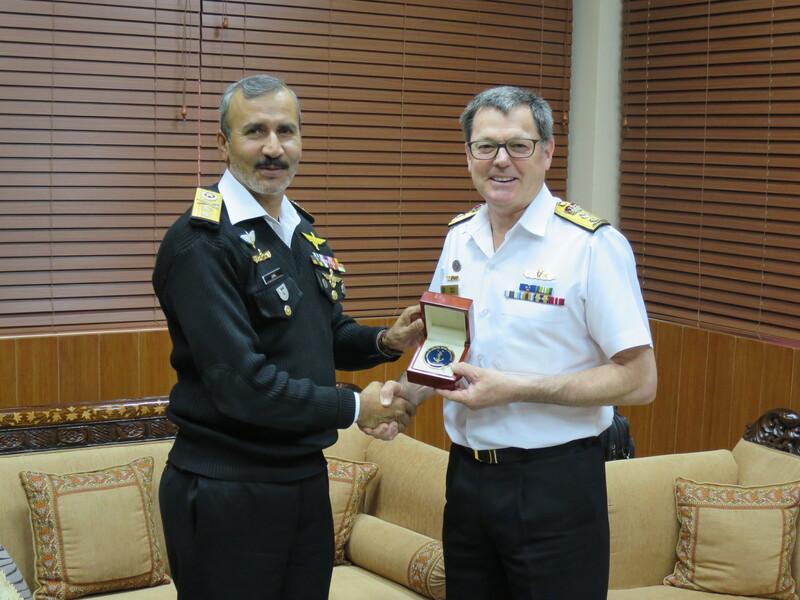 A Combined Task Force (CTF) 150 delegation, led by Commodore Daryl Bates Royal Australian Navy, recently met with senior leaders of the Pakistan Navy during a three day visit to Pakistan. Pakistan is both a regional nation and a significant contributor to Combined Maritime Forces (CMF) operations, having joined the coalition in 2004. 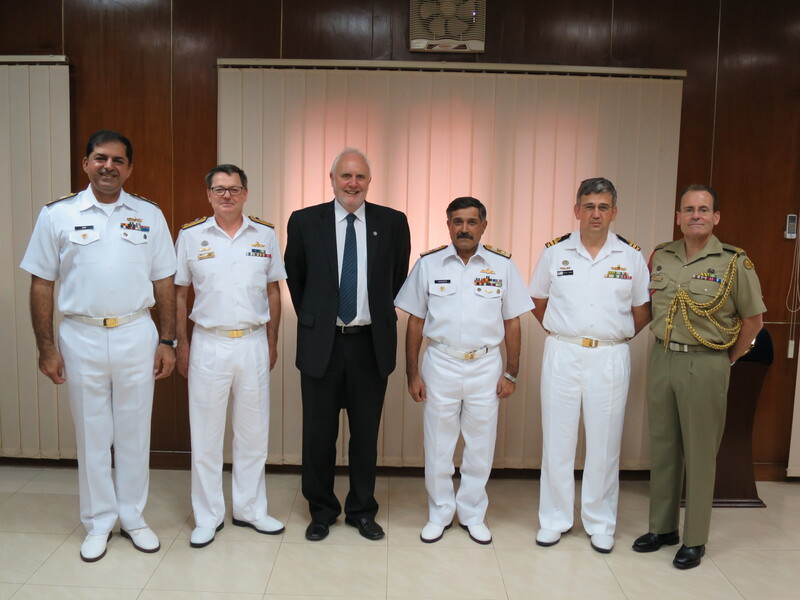 The CTF 150 delegation met with key commands of the Pakistan Navy in Islamabad and Karachi, to identify opportunities to improve the exchange of information and better coordinate assets in support of operational objectives. From left to right, former Commander of Combined Task Force 150, Commodore Asif Khaliq (Pakistan Navy), Commander of Combined Task Force 150, Commodore Daryl Bates (Royal Australian Navy), Australian High Commissioner to Pakistan, His Excellency Peter Heyward, Commander Karachi, Vice Admiral Khawaja Ghazanfar Hussain (Pakistan Navy), Combined Task Force 150 Planning and Regional Engagement Officer, Commander Michael Turner (Royal Australian Navy), and Assistant Defence Adviser to Pakistan, Major Rick Lovelock (Australian Army). 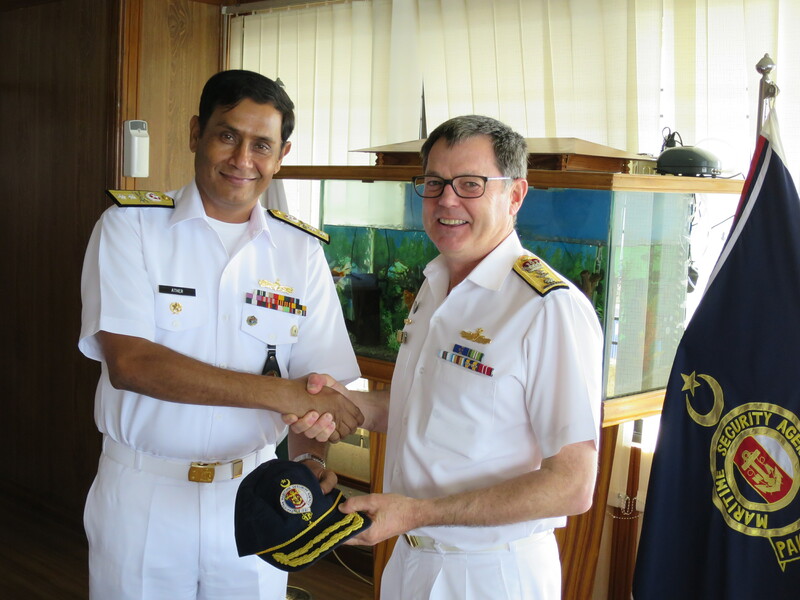 The visit provided a great opportunity for Commodore Bates, who recently assumed command of CTF 150 from Pakistan, to express his gratitude to Pakistan for their steadfast support to the CMF. Commander Combined Task Force 150, Commodore Daryl Bates exchanges gifts with Director General Naval Intelligence, Rear Admiral Jamil Akhtar in Islamabad. The CTF 150 command element is currently staffed by a team of 25 personnel from the Royal Australian Navy. Its principal mission is to maintain maritime security and deter, disrupt and defeat attempts by international terrorist organisations to use the maritime environment as a venue for an attack or as a means to transport personnel, weapons or other materials. Director General Maritime Security Agency, Rear Admiral Athar Mukhtar and Commander Combined Task Force 150, Commodore Daryl Bates exchange gifts. CTF 150 is one of three task forces commanded by CMF, a multinational naval partnership of 29 nations, which exists to promote security, stability and prosperity across approximately 2.5 million square miles of international waters, which encompass some of the world’s most important shipping lanes.